The guilts must have set in or otherwise its the looming deadline, but I have done some more on the TQ raffle quilt. I bought some more fabric on Friday at QuiltCraft in Margaret Street. I do realise now I got pieces bigger than I needed but I think we should be able to use the left-over fabric to make a lucky door prize for the Open Day or perhaps the Qld Quilters picnic, which we are hosting next year. 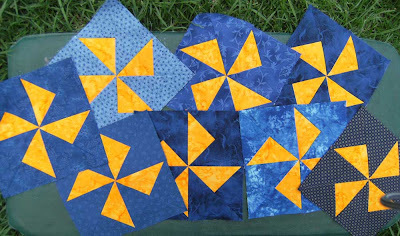 Today I pieced these pinwheels - not as perfect as I would like but I think they will do. The photo colours aren't quite true - the pinwheels are orange in colour. I also trialled these hearts. I have not finished the raw edge off. I am vaguely hoping someone might take these home with them on Tuesday and finish them before Saturday when we get together to work some more on the quilt. Anyway if no-one can take them home, we will do them on Saturday. I thought it best to finish the raw edge after re-joining the heart as that way if there is a little wiggle in the joins then it may be camouflaged with the blanket-stitch or sating stitch or whatever. A note for anyone involved in the design of this quilt - I have made these blocks 6" square (finished). We had planned 10" before we adjusted the size. However on checking the other day, the template is for a 6" block and I decided it would be easier to leave it that size than adjust it. 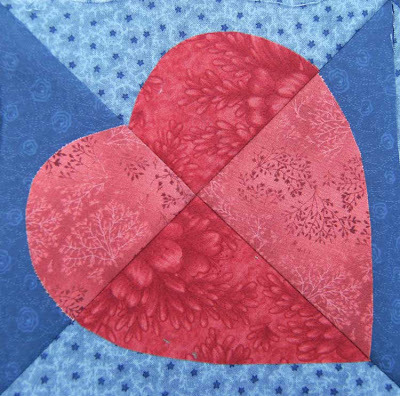 Plus the hope is that we have another narrow row lower on the quilt and it should balance or reflect that one. On the homefront - I have made a lovely corned silverside with beans, corn and spuds, an apple cake type dessert and have now just realised that there is now only two of us home for dinner (instead of the usual four) - I hope Mr D is hungry! - whoops just burned the spuds - shouldn't blog while the stove is on without at least putting on a timer! Sue, these blocks look fab. Those blocks look GREAT! I can't wait to see the whole quilt together - wait, that might even be this weekend, huh? Shock!! I never ever burn the spuds while internetting, oh no, not me, la la la.... and if you believe that, let me tell you about beachfront property in Toowoomba, eh? !